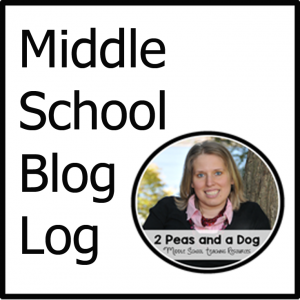 Picture books are great vehicles for clarifying one particular story element for the class. 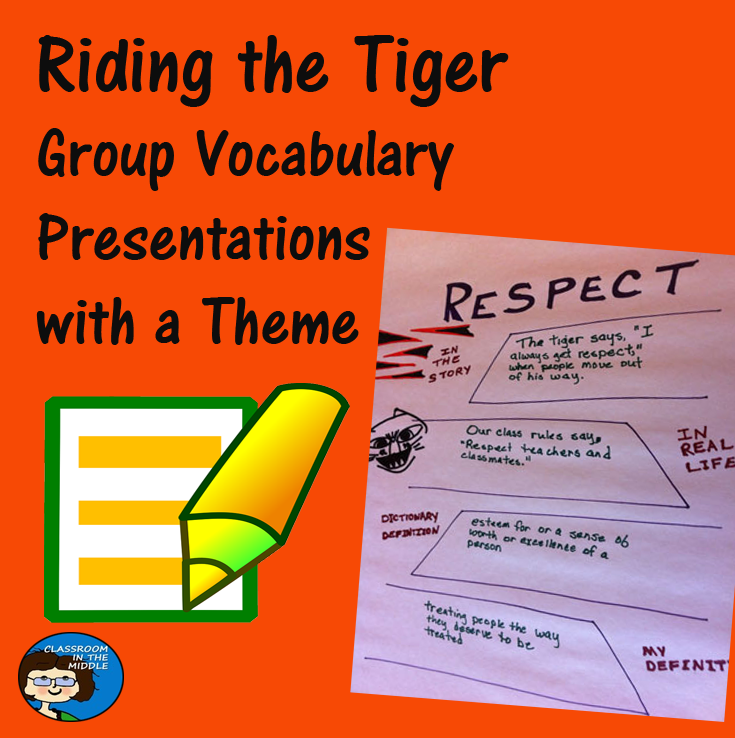 For example, the book Riding the Tiger, by Eve Bunting, is a great one for introducing theme. 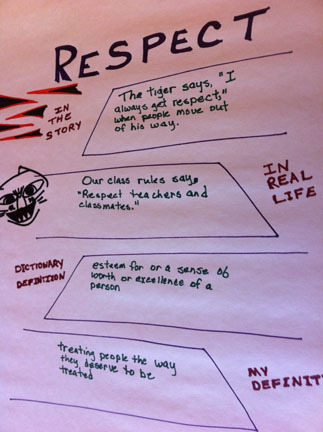 One way to do that, of course, would be to discuss the theme of the story after reading the book to the class. 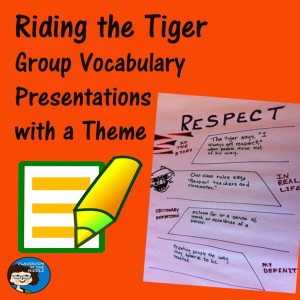 But for a more engaging lesson, and one that also incorporates other goals including vocabulary and group presentation, this story is perfect for this group vocabulary presentation lesson. 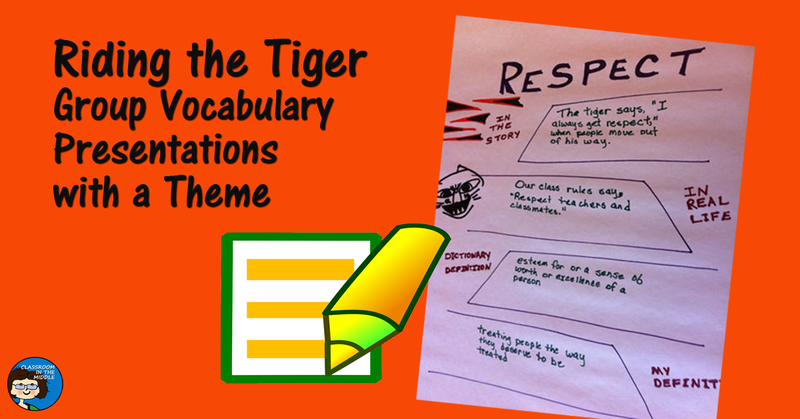 There are many good vocabulary words that go with the theme of Eve Bunting’s Riding the Tiger, especially words that have to do with character qualities. 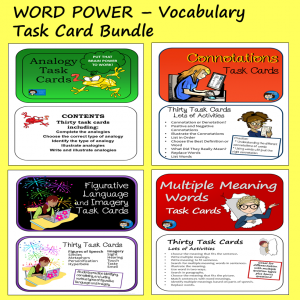 Some of them are “easy” words, and this provides the perfect opportunity for a different type of vocabulary lesson – one in which students delve into a single word in depth. After reading and discussing the story is a perfect time for a vocabulary activity in which student groups each focus closely on one word. Here is a list of possible choices. Some of the words are from the story; others express ideas that are in the story. 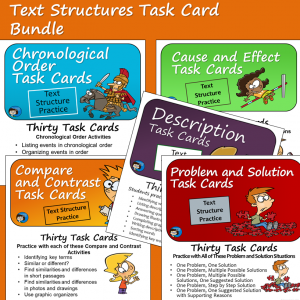 For this vocabulary activity, students work in small groups. Assign one word to each group, or have groups select their words. It would be good if each group had a different word to work on. Give each group a sheet of newsprint or other large paper and some markers. On their paper, have group design a four-part graphic organizer in which they present: 1) an example from the story, 2) an example from real life, 3) a dictionary definition, and 4) their own definition. Finally, have the student groups add illustrations to prepare their creations for presentation to the class. After creating their graphic organizer, each group should decide how they will present it to the class – who will present which part, etc. Finally have each group present their work to the class. Since the meanings of the words overlap, there should be some interesting connections between the posters that the class can discuss for a nice ending to the lesson. Here is an example of what one poster might look like, but student groups will each enjoy coming up with unique and interesting designs of their own!